FAQs - Gemini Chokes | Winshoot s.r.l. Do you need some help? Browse our FAQs. 1) How can I mount a choke tube? nytime you use a choke tube either in the barrel of your shotgun or installed on the same, make sure that it is perfectly intact, especially as for the diameter abutting the interior of the bar itself. During use, check the clamping; the choke tube must always be firmly tightened in order to avoid any breakages or explosions. If there are any spaces between the barrel and the choke tube itself, the gases could penetrate and provoke problems of different seriousness degree. Use the proper key to proceed with the correct tightening. We recommend you read the guide “5 things you must know for a proper use of the choke tube” for further information. 2) Is it normal to remark a step milling inside the barrel? Once the choke tube has been installed, if you check it looking from crowned muzzle, it is normal to observe a slight step milling. This minimum difference in terms of diameter, equal to about 3 tenths, is the guarantee that the choke tube fitting is larger than the barrel core. If such step milling was not visible, there would be the risk of mounting it inversely, what could quite likely lead to the damage or the breakage of the choke and, sometimes, even of the barrel. 3) How must a choke tube maintenance be managed? Once the shotgun has been used, carefully remove it and clean both the choke and its housing, especially if you intend to rest the instrument for some time. When you decide to restart your sporting or hunting activities, we advise you to lubricate the choke with a minimum amount of special grease, resistant to high temperatures. Keep the choke tubes in a dry place. We suggest you read the guide “5 things you must know for a proper use of the choke tube” for further information. 4) How must a choke tube cleaning be managed? If you shoot frequently, clean your choke tube at least every 15 days. You can use an ultrasonic cleaning machine, alternatively, our cleaning kit including 1 brush for the inner part of the choke tube, 1 brush for the outer one (Ported +20 mm), 1 bottle of detergent, 1 bottle of grease and a small cloth. We recommend you browse the guide “5 things you must know for a proper use of the choke tube” for further information. They both stick out 20 mm past the barrel, they are performing and also easy to be installed – remember to always check that they do not rest on the crowned muzzle; about 1 mm "void" must always remain between the choke tube and the barrel (read here: "5 things you must know for a proper use of the choke tube"). Yet the latter requires a greater frequency as for the external part cleaning which gets dirty due to the escape of gases. Both of them are characterized by an excellent shooting comfort. You shall find 11 constriction sizes for these 2 models in the catalogue; choose the ones that best suit you depending on your type of activity, by following our tables on the page “How to choose a choke tube for Sport Shooting” and “How to choose a choke tube for hunting”. 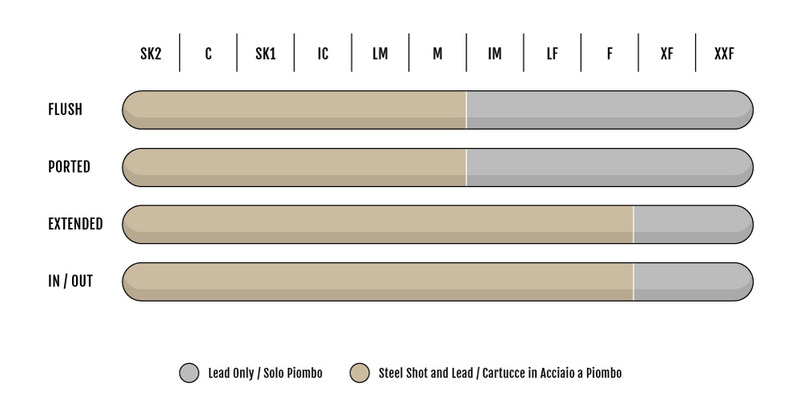 Ported +20 mm choke tubes are available in the Steel Shot version (for lead-free ammunition) only up to the M (***) constriction size, while the Extended +20 mm ones in the Steel Shot version up to the F (*) constriction size. They are characterized by a particular internal profile with a long cone, suitable to minimally deform the shots of the shell and to achieve denser and more uniform cones of fire. The In/Out +50 mm and +100 mm choke tubes can be used with several constriction sizes, with every kind of ammunition, except the XF and XXF ones which can be solely used with those made of lead; they are available in the Steel Shot version up to the F (*) constriction size, as well as for the above mentioned Extended +20 mm. It is advisable to browse the guide “In/Out Choke Tubes” for more details. 7) What is the best suited choke tube for Sport Shooting? You have decided to use a choke tube for your sporting activities, but still can’t steer yourself towards a choice? No problem, we have drawn a brief article to answers all your doubts! Read "How to choose a choke tube for Sport Shooting". 8) What is the best suited choke tube for Hunting? Are you looking for the proper choke tubes for your hunting activities? We have drawn a brief article to answers all your doubts! Read "How to choose a choke tube for Hunting". 9) What choke tubes are the best suited for hunting in “wetlands” or to use steel pellets in general? If you are used to hunting in wet areas you certainly know that the legislation provides for the use of lead-free ammunition only. The latter are suitable to all of Gemini choke tubes bearing the words Steel Shot or the lily drawing (they are obviously usable also with lead ammunition). To learn more, we advise you to read this article: "How to chose a choke tube for Hunting". Our dispersant choke tubes boast an optimal performance for short distance shooting (within about 20 metres) with a cone of fire width diameter of one metre already at a distance of 10 metres. The spreading effect is greater for cartridges provided with container, it is not necessary to use the scatter ones. Dispersant choke tubes tend to get stuck and it is required a certain amount of force to loosen them, it's a common problem to all the rifled short feed pitch choke tubes. We have tried to get rid of this problem but without any significant results, it is just the short feed pitch right-handed rifling and its height which convey an excellent dispersing result, yet giving rise to such drawback. Even if that does not allow to solve the problem completely, we point out that it is therefore necessary to lubricate the choke tube with some grease or vaseline paste, in addition the key can be purchased with an oversized traversing lever in order to facilitate disassembly. We always recommend, especially in this case, you loosen the choke after use. It is advisable to browse the guide “Paradox (or spreader)” to find out more. 11) What is a stock adjuster? Made of Ergal and subsequently anodized, it shows-off 40 mm projections provided with sets of spacers allowing adjustment from 0 to 25 mm. It is easy to be installed without interpolation since its ends are semicircular, the relevant reduced encumbrance, 24 mm, allows the use even for stocks, which are narrower than those of semi-automatic shotguns. 32 gram ammunition is currently used for electrocibles, hence it is advisable to use 5/10 on the first barrel and 8/10 on the second one.